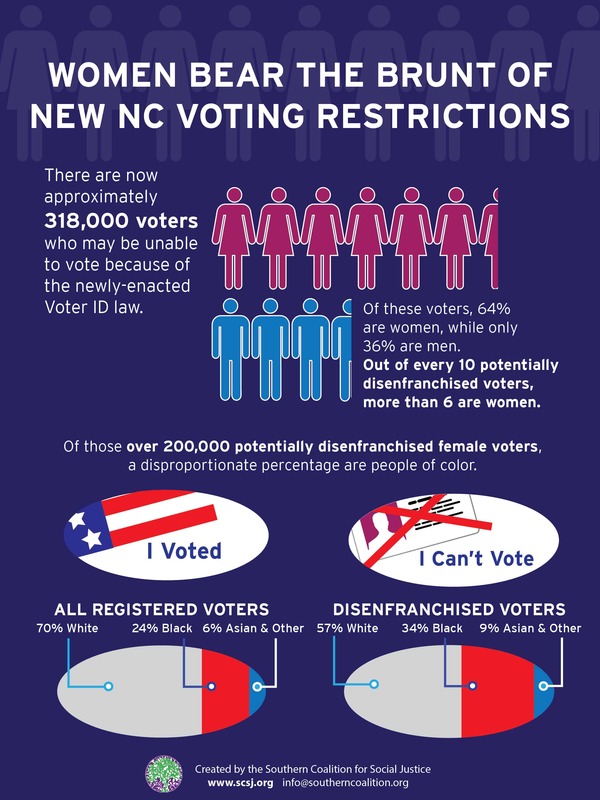 It’s 2014, and North Carolina’s Monster Voter Suppression bill is beginning to go into effect. While people are NOT required to show a photo ID in order to vote in 2014 elections, precincts WILL be asking you whether or not you have a valid photo ID. Even if you say no they still have to let you vote, but this is yet another obstacle between properly registered voters and the ballot box. Add this to the discriminatory redistricting maps that are segregating voting precincts, and some are saying that the voting landscape in North Carolina is as bleak as it has been since the Jim Crow era. 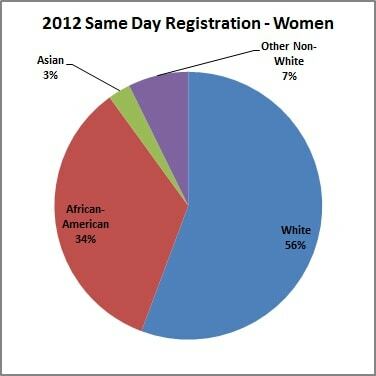 Not surprisingly, the people most impacted by all of these changes are women and people of color. 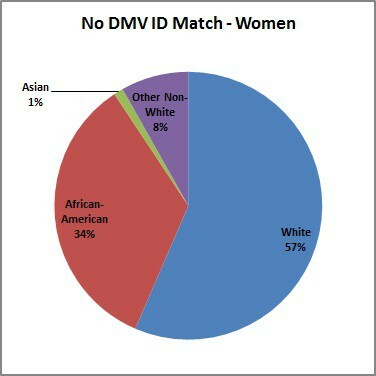 The Southern Coalition for Social Justice has conducted a review of the 318,644 registered North Carolina voters from the 2012 elections who did not have a valid, DMV issued photo ID that matched the name on their voter registration card  and found that, of all registered voters, NC women voters and people of color are disproportionately affected by virtually every part of the state’s new monster voter suppression law. SCSJ has filed suit opposing North Carolina’s Voter ID law, and a separate suit challenging other aspects of NC’s new voter restriction law including limits to early voting, the end of provisional ballots for out-of-precinct voters, and the elimination of same-day voter registration. In the NC Redistricting suit, SCSJ has argued to the North Carolina Supreme Court that packing all minority voters into a few precincts dilutes their voting strenght throughout the state, and that racially gerrymandered districts have so changed voting precincts that thousands of people are assigned to the wrong voting precinct and thus disenfranchised. In all of these suits, SCSJ argues that NC voting restrictions disproportionately affect people of color, the elderly, students, and the very poor. It has now become clear that women are also experiencing new obstacles to exercising their right to vote. Stories from other states show that strict voter ID measures are already disproportionately affecting women voters. For example, Texas Senator Wendy Davis was forced to sign an affidavit to vote in 2013 state elections because her photo ID was not an exact match to her voter registration card. If North Carolina’s new photo ID requirement goes into effect in 2016, there will be no affidavit option – if a person’s photo ID is not deemed acceptable, that person will simply be turned away from the polls. And the people most likely to have those non-matching documents are women voters. According to a much-cited 2006 study by the Brennan Center for Justice, a third of all women have citizenship documents that do not match their current legal name. This can be the result of marriage or divorce, both of which overwhelmingly result in the possibility of a woman changing her name and a man’s name staying the same. However, due to the broad reach of North Carolina’s new voting restrictions, SCSJ has found that women’s votes are being suppressed by many of NC’s voting restrictions in addition to the voter ID requirement. Next Article: NC Teachers & Students Deserve Better.